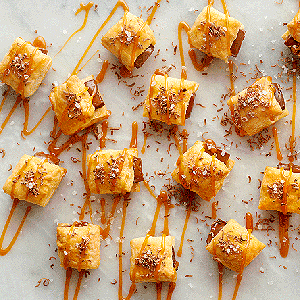 Hot, golden squares of puff pastry are stuffed with milk chocolate and then drizzled with caramel sauce and sprinkled with salt. An irresistible combination of flavors thats guaranteed to impress your guests! Heat the oven to 400°F. Line a baking sheet with parchment paper. Break 3 bars chocolate into 12 sections each. Grate 1/3 cup chocolate from the remaining bar. Sprinkle the flour on the work surface. Unfold the pastry sheet on the work surface. Cut the pastry sheet along the fold marks into 3 strips. Cut each pastry strip crosswise into 6 rectangles. Cut each rectangle in half, making 36 (about 1 1/2-inch) squares. Place the pastry squares onto the baking sheet. Bake for 15 minutes or until the pastries are golden brown. Remove the pastries from the oven. Using a sharp knife, cut a slit in the side of each hot pastry. Stuff each hot pastry with 1 chocolate section, pressing it through the slit in the side of the pastry into the center. Sprinkle the pastries with the grated chocolate. 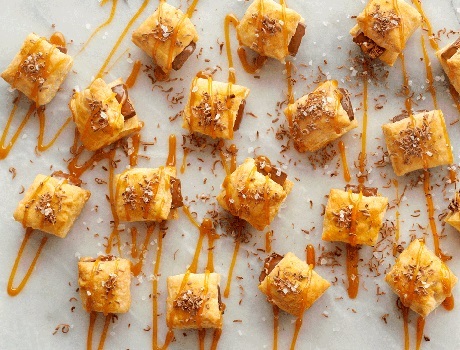 Drizzle each with about 1 teaspoon caramel topping and sprinkle with a dash of salt. Puff Pastry can puff up to 8 times its original thickness. That means even a sheet rolled to a thin ¼-inch thickness will rise 2 inches. You can brush an egg-wash glaze (1 egg plus 1 tsp. water) over the Puff Pastry to create a rich, golden sheen when baked.